Objects are covered thoroughly and early in the text, with an emphasis on application programs over applets. 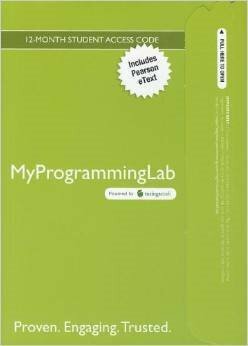 MyProgrammingLab is a database of programming exercises correlated to specific Pearson CS1/Intro to Programming textbooks. The exercises are short, focused on a particular programming topic, and are assignable and automatically evaluated. MyProgrammingLab provides immediate, personalized feedback which helps students master the syntax, semantics and basic usage of the programming language, freeing instructors to focus on problem-solving strategies, design and analysis, abstraction, algorithms, and style. Learn more atwww.myprogramminglab.com.